What is a Black Moon and Why Should We Care?! 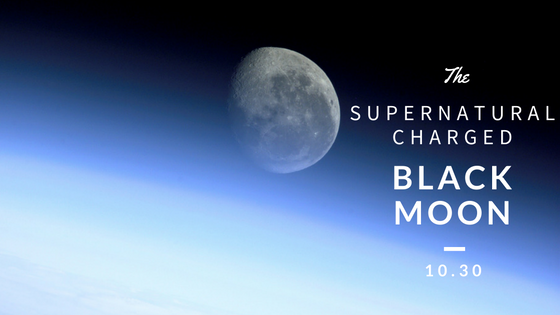 The term Black Moon describes the second new moon to fall in one calendar month. Fittingly enough our black moon arrives on Halloween, promising the perfect dark night as a backdrop for all the tricks and treats. If you’re not out donning a costume, I highly encourage that you take this potent night to plant some intentions for the weeks to come. New moons always carry the energy of rebirth and when coupled with a simple ritual, we can harness that energy and bring it with us into our next phase. Rituals are simply a joining of action and intention. Ritual = Action + Intention. Setting aside a few minutes each new moon to focus on truly listening to yourself can be all it takes to help shake loose a shift you’ve been hoping to manifest in your life. What would you like to fall away this next cycle? What thoughts, feelings, habits, actions, etc. are no longer serving you? What do you most desire (big or small)? What would you like to work on and shift your focus towards this next month? Once you’ve centered, write down everything you wish to release onto one piece of paper and the intentions you’d like to manifest onto another. Usually we know what it is we don’t want, but often our minds go silent when we’re instructed to pinpoint what it is we do want. I find a good way to discover your true intentions, the ones that may be hiding behind dusty old to-do lists and busy work, lies in just a bit of imagination. Close your eyes and envision the perfect version of your life, instead of focusing on what that exactly looks like, hold onto the feeling that accompanies living your dream. Let that sensation soak into every fiber of your being and then write from there. You may be surprised what bubbles up! Once you’ve jotted down these two opposing inventories, you have a few options…I like to burn my list of what I want to let go of over a candle (PLEASE BE CAREFUL)! The list of intentions you are manifesting can be hidden beneath your favorite houseplant to grow, tacked next to your favorite art piece, or placed in any special spot in your home. Go with what feels right; there is no wrong way to do this! You create your own rituals. Remember all it takes is joining action with intention, even if you only get as far as lighting a candle and thinking about these things! If you begin to repeat the ritual month after month you may see the same intentions pop up on your list. Don’t be discouraged, often our intentions take longer than a month to come to life! You can be sure that it will all unravel in perfect divine timing, whenever you are most ready to receive.